Ancient Chinese Medicines are a fascinating part of TCM (Traditional Chinese Medicine). Powerful, individualised and remarkably effective traditional Chinese Herbal formulas and remedies are seeing a huge upswing in popularity thanks to a growing interest in natural remedies. In this article I want to introduce you to these ancient medicines and give you some content in which to better appreciate them. It's important to note that Chinese Medicine is a complete system of medicine as comprehensive in it's scope as our own Western Tradition. In fact, fundamentally they are the SAME system of medicine, though looked at from different cultural perspectives. Regardless of these cultural and linguistic differences the subject of health - the human body is the same. And often the same treatment principles applies - it's understanding that application that is the difference. Traditional Chinese Medicine is eminently practical. Diagnosis is differential in natural and based on pattern discrimination. Essentially within the traditional of TCM different diseases are caused by imbalances within the organs of the body. A diagnosis is made by examining a patient according to their history, physical examination and assessment of their symptoms. Once the TCM physician has gathered this information they then must determine which patterns of disharmony are responsible for the patients unique presentation. Once a diagnosis is in place - treatment is outline and administered. Now, traditionally the first step is to place patients on a plain 'rice gruel' diet for 10 days. I have never and will never do that to a patient - I've tried rice gruel it tastes like wallpaper paste. I wouldn't do that to you. However such a practice highlights a key component of TCM - dietary therapy. The food you eat has a HUGE impact on you health, something LONG understood in the East. By placing you on a 'rice gruel' diet for 10 days one eliminates anything in your food that can be causing illness or imbalance in the body. Today that's not an effective solution. People in the West, typically, attend an acupuncturist typically when they are all ready chronically imbalanced. In China and the East they seek the treatment of a physician at the first sign of ill health when a dietary elimination would be effective. By the time I see patients they've been eating inappropriately for years. (What do I mean by that - check out my short article on TCM Nutrition). Ancient Chinese Medicines, often in the form of herbs taken from plant and mineral sources are typically added to the rice gruel for another 10 days. That generally resolves the problem in China. 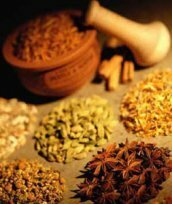 These herbs are selected to specifically treat the underlying condition of imbalance. If the patient requires a stronger or more immediate medicine - then acupuncture, moxa and tuina are applied. The herbs of ancient Chinese medicines are a fantastic addition to TCM treatments. They provide quick and effective results when used skilfully, supporting and enhancing one’s health with no side effects. Again, I never make my patients eat rice gruel with herbs. That's just impractical. Instead I prepare them in a variety of manners and we'll look at them now..or better still sneak them into peoples foods. For example a herb I often use with my patients is called 'Rou Gui'. I simply have patients add a dash of cinnamon to their coffee or apple-sauce. Fast tastier than rice gruel and just as effective! Current medication and drugs promoted by the pharmaceutical industry focus mostly on proving a symptomatic band-aid as opposed to truly resolving a medical condition. Think of the common cold. Rather than treating the actual virus at work, drugs are used to suppress the symptoms, such as fever, shivering, sweating sneezing, coughs, and runny noses all of which are methods used by the body to expel the invading virus. By contrast the Ancient Chinese Medicine are based on strengthening the foundation of one's health rather than just patching things up. Ancient Chinese Medicines work from the inside out; they treats the core issues that underlie our symptoms, which will either sooner or later rectify the symptoms themselves. Western drugs on the other hand work from the outside in. They offer immediate symptomatic improvement without directly addressing the deeper cause of the symptoms. Now of course there are certain cases where this is warranted and most definitely necessary, but even still it is acknowledged that the long-term use of Western drugs for chronic health problems can be detrimental to one's foundation of health. This is why many people are increasingly turning to natural plant-based medicines and nutrition before going the drug route. It is a gentler, more life-affirming way to heal yourself. The traditional Chinese herbalist will use a variety of combinations, tailored to your specific constitution and condition and a talented herbalist will combine several herbs to produce a synergistic healing effect, focused on your unique needs. So What Are Ancient Chinese Medicines? Ancient Chinese Medicines come in several forms including capsules, tablets and liquid tinctures. I frequently prescribe simply and easy to prepare teas with delicate combinations of herbs to treat the patients imbalances. I also use topical liniments and plasters which are very helpful in reducing pain, inflammation, swelling, and speeding the healing process. Liniments are liquids applied directly to the skin, while plasters are Chinese herbs embedded in a cloth backing which are applied to the skin much like a large band-aid. These can be particularly effective for treating back pain etc. I will teach my patients easy to make tea’s that can be used to treat a number of everyday conditions made from simple available herbs and roots you probably have in your kitchen right now. The delight of Ancient Chinese Medicines is their versatility. One single formula can be prepared to treat a condition such as infertility and resolve the myriad by products of that diagnosis such as PMS, cramping, muscular pain, frustration and depression etc. When the root cause of the disharmony is addressed all of the symptom s associated with improve and disappear.